There’s so much to talk about here! Since this is a math blog, let’s start there. The Purge had a 1047% return on investment in its first week in the box office alone. That’s ridiculous. It was filmed in 20 days. There’s no investment on Earth that can rival it. 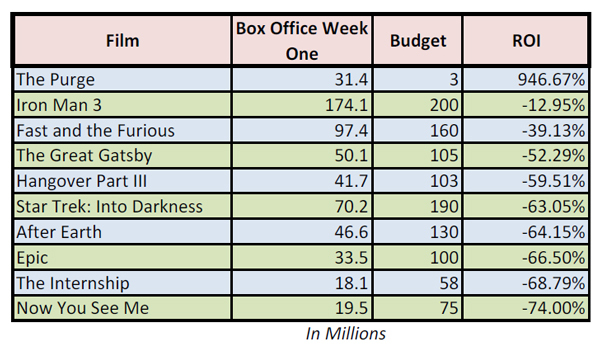 Here’s a table of the top 10 films in the box office this week that compares the films first week’s box office gross and their budgets. Last year when we hit on stats in Algebra II, I went to box office numbers as interesting data sets. This takes it to a whole other level. How can we best visualize how unbelievably historic The Purge‘s opening weekend was? Was it the best opening weekend ever, by our ROI metric? Iron Man 3 earned $174M in its opening weekend; how does that compare to The Purge? If you were in charge of Universal Studios, would you prefer to have invested $3M in The Purge or $200M in Iron Man? Would knowing the latter is approaching $400M in gross box office revenue change your thoughts? Most reviews have lauded the concept before lamenting the execution, which is unfortunate. I’ll probably wait for this one to hit the library shelves, but I certainly am more interested in it than I am Iron Man or Star Trek.